Grandson of Hudson Motor founder says hall needs do more. 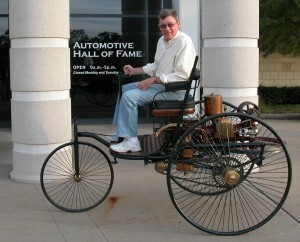 Bill Chapin takes a spin on the 1893 replica of the Benz three-wheeler, which normally sits in the Automotive Hall of Fame, but was recently taken out and operated. “That was really exciting,” Chapin said. Americans have a love affair with their cars that goes back to the creation of the auto industry more than 100 years ago. So it would make sense that they would want to visit the cradle the automotive industry, Detroit. But far too many people only think about crime, auto bailouts and bad football when they think of Detroit. They don’t realize Detroit’s role in putting the world on wheels. That’s where Bill Chapin comes in. As the new president of the Automotive Hall of Fame in Dearborn, Chapin has some ideas about how to get the general public to share his passion for Detroit’s automotive heritage. Click here to visit the Automotive Hall of Fame’s Web site. AHF is the place to go to learn about the people whose names are on the cars we drive. Ford, Chevrolet, Chrysler, they’re all there, but so are Honda, Peugeot, Daimler and Ferrari. It’s not as much about the cars as it is about the people who created the automobile, then made it better over the course of history. You can also learn about The Driving Spirit, a theme that describes the unseen force that pushed inventors to think of something better. Chapin, who took over leadership of the hall in July after serving on the board of directors, sees the AHF as a starting point for visitors who want to learn where they can go to learn more about the area’s automotive heritage. Chapin is one of the founders of the Motor Cities National Heritage Area, an organization affiliated with the National Park Service that promotes automotive tourism in the Southeastern Michigan area. But before the AHF can become the starting point for auto tourism visitors, it needs to get more visitors to come to the hall. Chapin knows that. “We need to do a better job of making sure people know it is here,” Chapin said. And Chapin, who has spent his career in automotive marketing has some ideas to help. First, he wants to promote the hall as a destination for school groups. He also wants to promote the hall, which has a kitchen, meeting room and other amenities as a setting for hosting special events. Chapin also wants to do more with the hall’s annual induction ceremony, coming up in October, which celebrates new members of the hall. “It’s the Academy Awards of the auto industry,” Chapin said. He added that the hall needs to improve its displays. He is pa rticularly interested in adding video from the hall’s extensive video library to visitor experience at the hall. He said that for years, a short video collection of inductees’ career has been shown at the induction ceremonies. He wants to share that collection, which is now gathering dust in the hall’s archives, with visitors. Also, the hall’s Web site, does little to celebrate the lives and achievements of the inductees. ”It’s really just a list of the people who have been honored by the Automotive Hall of Fame,” Chapin said of the current Web site’s roll of honorees. Chapin wants to reach out to living inductees and recipients of the hall’s “Young Leadership & Excellence Award,” whom he described as the equivalent of a university’s alumni. For example, AHF could host a networking event, which could turn those alumni into promoters of the hall, he said. All of that will help Chapin achieve his ultimate goal, which is to promote auto tourism in the area. “We have a great story to tell,” Chapin said. Southeastern Michigan’s automotive heritage story is told at several places around Detroit, as well as other cities including Lansing and Flint. AHF’s neighbor, The Henry Ford, Ypsilanti Automotive Heritage Museum and the Eleanor and Edsel Ford House in Grosse Pointe are just a few of the attractions Chapin mentioned. He said that he’d like to have a concierge in the AHF lobby to help visitors plan their visit to their choice of the area’s automotive heritage sites. Chapin pointed to other areas, such as Washington, D.C., which have done a masterful job of showing visitors what there is to do in town related to their specific heritage. While Chapin said Detroit’s institutions can use the capital city’s Web sites as a template, he thinks Detroit has institutions and stories that rival anywhere in the country. Chapin, himself, could be described as a living piece of Detroit automotive history. His grandfather, Roy Chapin, was the founder of Hudson Motor Car Co., and his father, Roy Chapin Jr., was chairman and CEO of American Motors. At one time, Chapin said, he tried to downplay the fact that he was born into a family of automotive royalty, but he now embraces his own heritage. This entry was posted on Wednesday, September 15th, 2010 at and is filed under Automobiles. You can follow any responses to this entry through the RSS 2.0 feed. Both comments and pings are currently closed.